Slow Food is coming for the first time to Denver this March 7th aiming to present the 2019 edition of Slow Wine Guide. This year the event will welcome an even more diverse selection of high quality and sustainably produced wines. 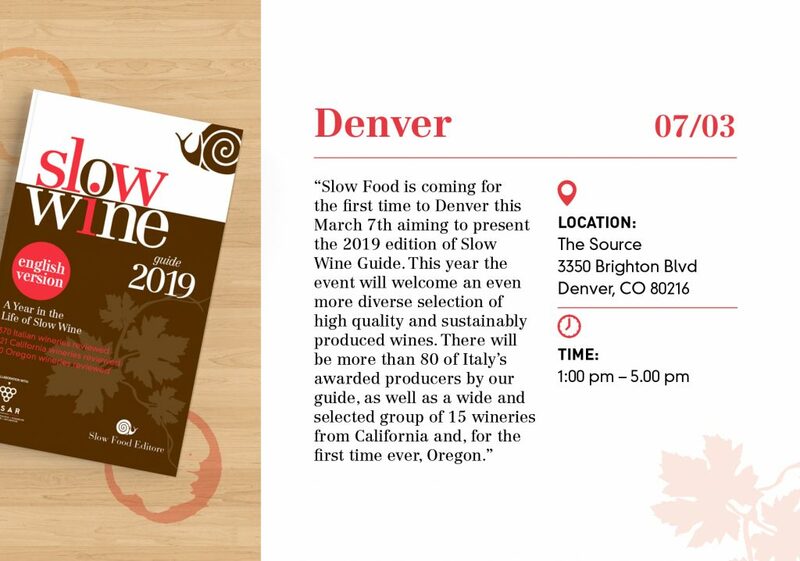 There will be more than 80 of Italy’s awarded producers by our guide, as well as a wide and selected group of 15 (12) wineries from California and, for the first time ever, Oregon. The fair will bring together producers and wine industry professionals, meaning to help growers target new markets and existing wineries reach the still-developing Slow Wine scene. Moreover, we will grant visitors a personal code that will allow them to access Slow Wine Guide e-book. Join us in this unmissable event, discover new wines and meet the producers that represent Slow Food values – good, clean and fair.